Cegedim Health Data provides Real World Data and Evidence to enable advancements in patient outcomes. With a data history of over 24 years and millions of anonymised Electronic Health Records immediately accessible from our THIN (The Health Improvement Network) European database, we are the trusted partner for RWD Evidence and Services for more than 25 pharmaceutical companies. 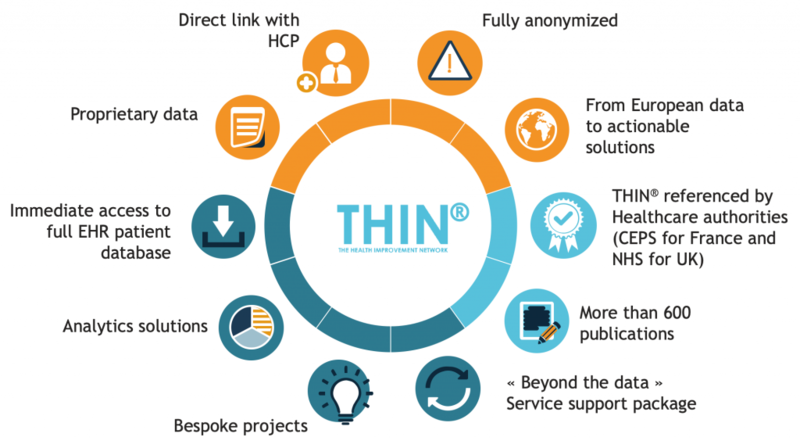 Driving standards across the industry, our expertise in IT solutions for HCPs and in data management provides precise, ethical, actionable and fully anonymised patient data. We think outside the box to support our customers to deliver the application of data, intelligence and insights. This enables vastly improved business performance, society and patient outcomes. Our proprietary data is used by leading healthcare authorities, academics, pharmaceutical companies and research organisations for healthcare research and analysis. More than 600 scientific papers have been published as a result of evidence derived from our THIN database. Cegedim Health Data is part of the Cegedim Group, an innovative Technology, Services and RWD Company specialised in the healthcare ﬁeld for more than 50 years with more than 4,500 people worldwide.